When it comes to the many works of 80s aidoru Minako Honda（本田美奈子）, it looks like I will be on the installment plan for eating crow for the foreseeable future. Having scoffed at my first look at her through a live performance on one of the music rankings show of that decade, over the years of doing this blog, I've come to realize that that performance was more of a notorious off-tune one-off and that Honda actually did have some good singing chops even during her aidoru era. 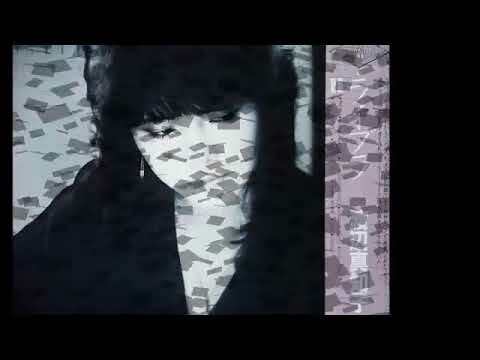 Case in point: her cover of the late Belfast guitarist and singer-songwriter Gary Moore's October 1986 single "Crying in the Shadows", given the title of "the Cross ~ Ai no Juujika" (Cross of Love) for Honda as her 8th single from September 1986. When I heard it for the first time, I just went like "Why wasn't I hearing this stuff from her instead of 'Oneway Generation'?" I think Honda was still an aidoru at the time but from listening to "the Cross", she had apparently made some grand leaps into solid pop-rock. I wouldn't really compare Honda at the time as a budding rock goddess but the former was really good with "the Cross" especially with that echoing voice. From what I've seen on her "Top 10" and "Best 10" appearances, it looked like she was going for a J-Madonna aesthetic back then, but with this song, I imagine her more as a Pat Benatar. With Moore having written and composed the original song, Yasushi Akimoto（秋元康）provided the Japanese lyrics. "the Cross" went as high as No. 5 on Oricon and was first included on her first BEST compilation, "MINAKO COLLECTION" from December 1986. That album reached No. 13. Moore was also involved in the recording of Honda's cover and also provided his guitar playing for the title track from her third album "Cancel" which also came out in the same month as "the Cross" although the single wasn't included in that album. To finish off, here is Moore's "Crying in the Shadows" which was included in the CD release of his 1987 album "Wild Frontier".